Looking at the tutorial, it says that: "Desktop Main and/or RT Main VIs (RT Main VI can stand alone to run interactvely, making Desktop Main optonal and RT required)". However, I think there should be also room for a pure FPGA application where even RT is not part of it and where the FPGA code is the toplevel. Are we allowed to take that additional step? I think for the beginner student there should be a few example apps that are extremely simple and can be understood within seconds of looking at the entire code. No involved communication between RT and FPGA, etc. All these fancy examples out there are way too scary for the beginner! I've just written my first myRIO pure FPGA app in about 10 minutes (nothing on the FP, no RT VI, no GUI!). coding took significantly less time than compiling . Funny enough, it worked fine on the first attempt! Of course I would like to get significantly more familiar with all this. I probably missed a few crucial points, so any feedback is very welcome. Basically it is a vocal remover for karaoke (similar to this for myDAQ), except it runs natively on the FPGA. Is this too simplistic? I am sure it requires significant polishing, but hey, it works! I just played some random old Johnny Cash songs I found on the internet using my cell phone (headphone jack of phone to myRIO:AUDIO_IN and myRIO:AUDIO_OUT to headphone). Pressing the myRIO button toggles between voice removal on or off. Hey, this is fun... The singer is barely audible when LED3 is lit, but everything sounds normal when LED2 is lit. Don't laugh! Here's the entire FPGA code of the only VI in the project (see picture, false case is simply wired across). Isn't it amazing how easy this all is! Is this something I should polish up as as app? Of course other more complicated algorithms could be implemented as more refined additional examples. Re: Vocal Remover: How about a pure FPGA app? Your assumption about allowing a pure FPGA application is valid, as long as the applicable requirements are met, the project template is created, and instructions on how to use the app are included. A section instructing users on how to restart the application after a power cycle without re-targeting the device would be helpful (this section would really just point out that once the FPGA is written, you can move the myRIO, plug un-plug etc., and the FPGA will run at start-up and so forth, as a user unfamiliar with FPGA might believe the host is required). "I think for the beginner student there should be a few example apps that are extremely simple and can be understood within seconds of looking at the entire code. No involved communication between RT and FPGA, etc. All these fancy examples out there are way too scary for the beginner!" 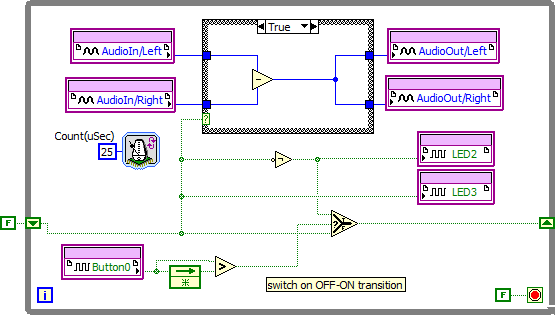 You have effectively summed up one of the basic goals of this program - to bring new beginner users into LabVIEW, allow them to be successful running code immediately, and teach them how to use LabVIEW to write their own code. Awesome! The application you've developed fits all the criteria we have for an application, and I believe it is something that users will absolutely use. It does need polishing, but what code doesn't? I think some clean, easy to understand FPGA code would be perfect. isn't included with the standard kit. little more involved. Should we avoid FPGA functions? You can put this down for me in the sign-up thread. I will polish it up, add documentation and all other required points and submit for approval in a few weeks. I had no problems activating, but I used our departmental academic key, not the one in the box. What kind of activation trouble did you have? What does it say in the license manager? (mine says expiration: never). You can change the branding of the environment in the Tools menu>Choose Environment. The number shows up as invalid, but I never investigated thoroughly because I was able to activate everything included with another serial number. I'm guessing the error had something to do with this being distributed internally. The side effect is that I don't know what that serial number was /supposed/ to activate. Maybe we should take the licensing question elsewhere. Have you run the license manager, it should give you full information about the currently licensed products. What serial number does it show on the "about" screen? I agree about taking it elsewhere. PM sent.